So you are looking for some baseball batting drills. 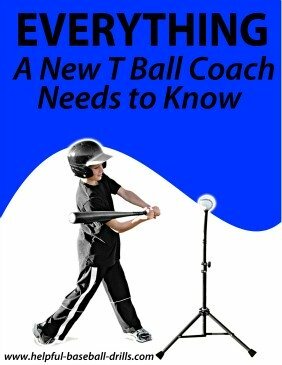 If you are new to this website, let us tell you we have talked about hitting off a tee and hitting soft toss in a couple of other youth batting drills. Besides live pitching, those are our two recommended batting drills. 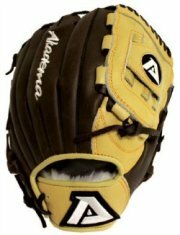 You can check them out at Batting Tee Drills and Baseball Hitting Driils - Hand Eye Coordination. But you are here to find some other hitting drills. And that is fine. There is only so much soft toss and batting off a tee one can do. So let’s look at some other ways to practice batting the baseball. 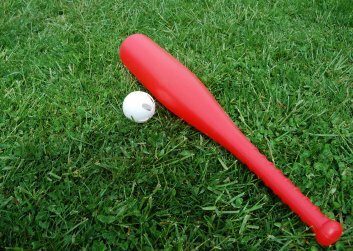 This drill is great baseball batting drill, but you will need dad or a partner. Get a bag of golf wiffle balls and have someone toss them to you at fairly close range. When we say fairly close, we mean like 20 to 25 feet for younger players and 30 to 35 feet for older players. The person tossing the wiffle balls should try and hit certain locations, like inside and outside corners. But this isn’t necessary, because this drill is really for hand eye speed. The extra practice of hitting in different locations will just make the drill that much better. And lots of times, with wiffle balls and the wind, the ball is blown around so much it turns out to be a great location drill. There have been times when we went to out of town games and forgot the wiffle balls. And when there wasn’t a sporting goods store around, so we just bought some marshmallows to toss and hit. This will work fine, but the marshmallows aren’t worth much after getting hit around, ha. So don’t plan on eating them later. Do you or a teammate have a problem with stepping out on a pitch? When a pitch is thrown, and the batter’s front foot takes a step away from home plate, that is called stepping out. It is also called hitting in the bucket, or hitting from the dugout. This problem is easily spotted, but hard to correct. And this movement away from the baseball takes all of the power out of the swing. Many people try the method of putting a log or brick behind the batter in practice, so that when he steps sideways, he will trip. You can try this, but it doesn’t work too often. A drill that does work more often is the step forward drill. Here the batter stands one step away from the plate. He first steps towards the plate with his back foot, and then he steps with his front foot. When the back foot hits the ground, the person tossing the ball pitches it toward him. It should arrive to the batter about the time his front foot hits the ground. Hopefully, this youth hitting drill will break the stepping out bad habit and teach the hitter to stride forward on his swing. Stepping out is a bad habit that usually take a while to fix. We are going to cut in here in the middle of these drills and give you some important information. Maybe you have seen batters standing near a fence and taking swings at the air? They are working on their short, inside swing. You stand near a fence with a bat. Hold the bat out and stand close enough to the fence that you cannot extend your arm completely. At this point you are close enough to the fence to do this drill. Now take some easy swings and work on getting the top of the bat thru the swing quickly. Your hands will have to be close to your body to do this. Once you feel comfortable with the easy swings, then speed up the swings. Keep doing this baseball batting drill until you are swinging at full speed. Do this several times a week and the next time you see an inside pitch, you will be surprised how fast your hands adjust and swing into the ball. The idea behind this drill is to you teach and help you get your lower body, especially your hips and legs, into your swing. You need to get mom’s broom and your batting tee. Place a ball on the tee. Now put the broom behind your back, right above your hips. With your hands gripping the broom, take your batting stance about six inches forward (toward the pitcher) from where you normally stand. Now, rotate or swing your lower body so that the broom comes around and hits the ball. At first it is going to be tough to even knock the ball off the tee. But as you practice, you will begin to hit the ball harder. This drill will help increase the power and speed of your swing. It may seem like a silly drill, but working with this baseball batting drill will really improve your hitting. Here is the last of this lesson’s baseball batting drills. In this drill we are just going to work on the upper body, mainly the arms. Often times you see a hitter with a bad uppercut. While a small uppercut is fine, a big uppercut is bad news. You will either miss the ball or pop it up. To work on a level swing, the batter needs to take swings from his knees. He can be swinging at tossed balls, a Hit-A-Stick or just air swings. With his arms closer to the ground, it is much easier for him to see his uppercut. Work on getting to a level swing. Another variation of this drill is to sit in a chair, and hit off a tee. Again, it is much easier to point out to the hitter when he uppercuts. Plus, the ball will pop up in the air off the tee. These two drills, with lots of practice, will correct an uppercut swing. 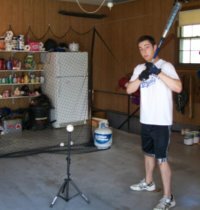 Here at www.Helpful-Baseball-Driils.com we sure hope these batting drills help you become a better hitter. In our opinion, there is no better game than baseball, and having a little success playing this great game makes it even more fun. Practice your baseball batting drills and go up to the plate with confidence. Good Luck.